We had enjoyed our week in Sydney, Australia and our trip to Cairns to snorkel and dive on the Great Barrier Reef. 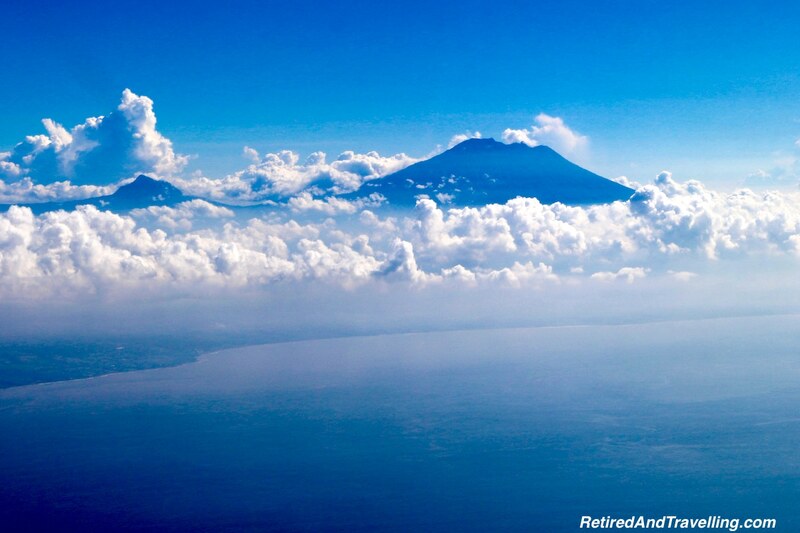 We were headed to Bali paradise to meet up with son Nick who had been our advance travel scout in SE Asia. 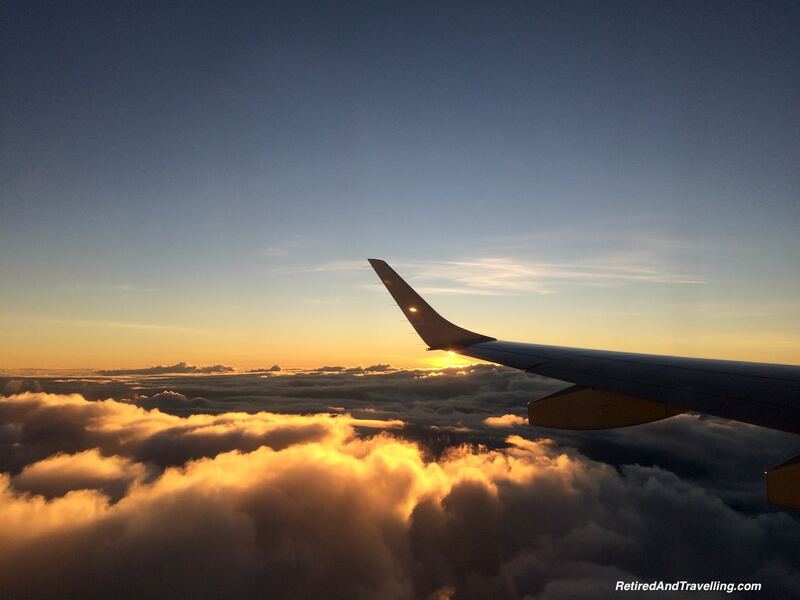 Our airplane took off from Australia in bright light of the rising sun, signalling a great start to our next adventure. 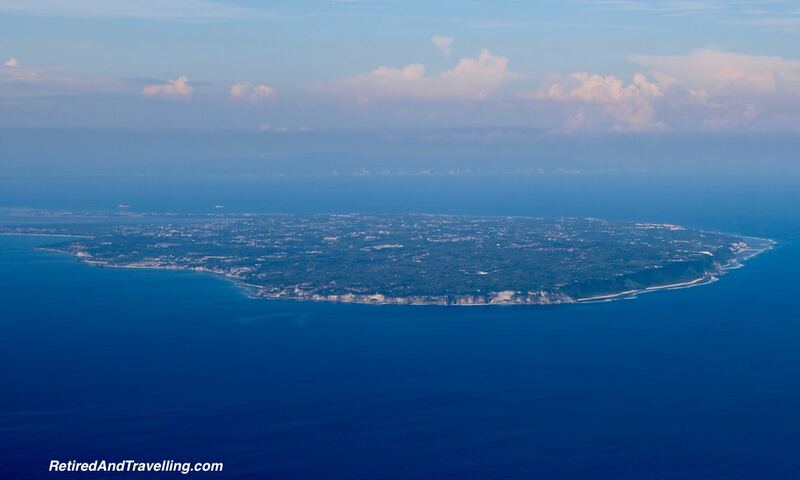 As we circled over Bali, we could see the blue waters surrounding Bali. 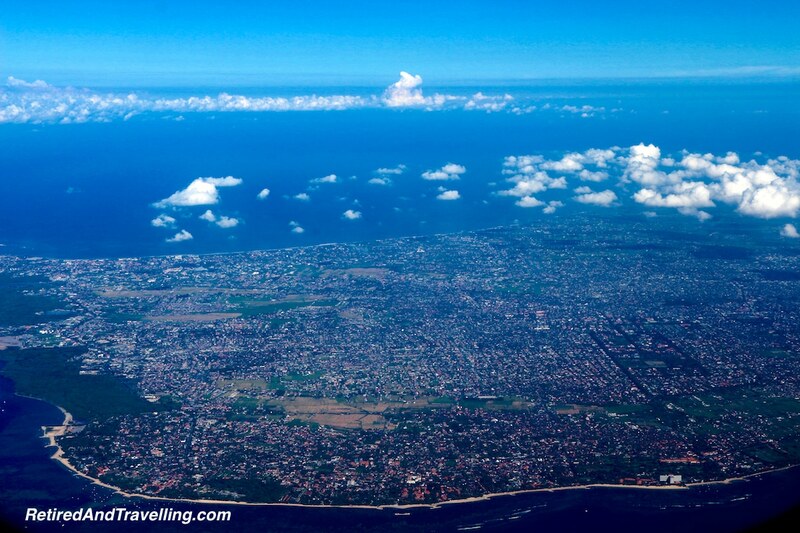 As we flew lower, we were surprised to see how populated Bali was – not all a beach paradise. We would find this heavy population to really slow us down as we headed out for day trips around the island. Unfortunately, I managed to pick up a lower respiratory tract infection and was moving slowly by the time we hit Bali. While Nick had been texting us about how hot it was in Bali, his messages did not quite convey how bad 30+℃ weather was when combined with close to 100% humidity. Most of our week in Bali paradise I felt like I had an elephant sitting on my chest! Nick was young and seemed to be handling the heat quite well. He had been in Bali for a few weeks and had a long list of things he wanted to share with us. The Intercontinental Bali Hotel on Jimbaran Bay that would be our home base for a week was very different from the home stay accommodations he had liked using before we arrived. When he found the drive between his place in Canggu and our home base in Jimbaran Bay to take up too much of his day, we decided he would just bunk in our spacious two story loft suite. He would get spoiled a little travelling with his mother who was sometimes a princess about where she stayed. 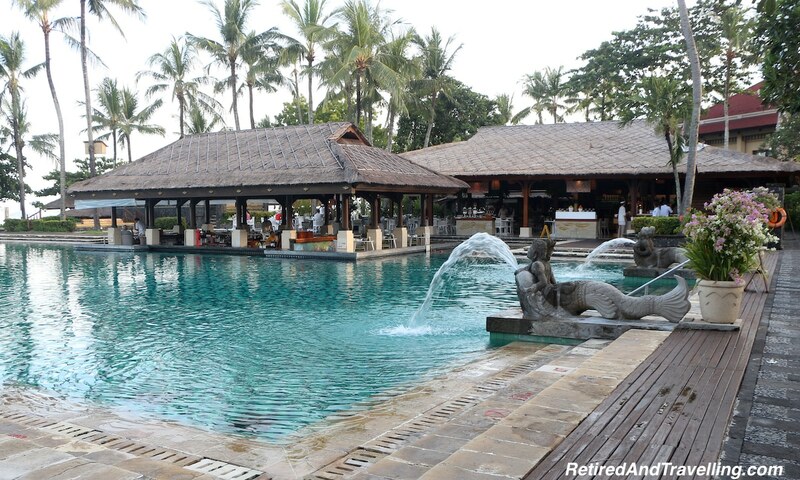 The Intercontinental Resort Bali provided a great base for us to spend a week in Bali paradise, alternating between lazy days enjoying the resort and day trips exploring other parts of Bali. We found exploring Bali to be quite easy. Nick had quickly got himself his trusty Scoopi scooter and drove like a local wherever he wanted to go. We watched the crazy scooter people swarm the roads going every which way and we were not tempted to join that fray. 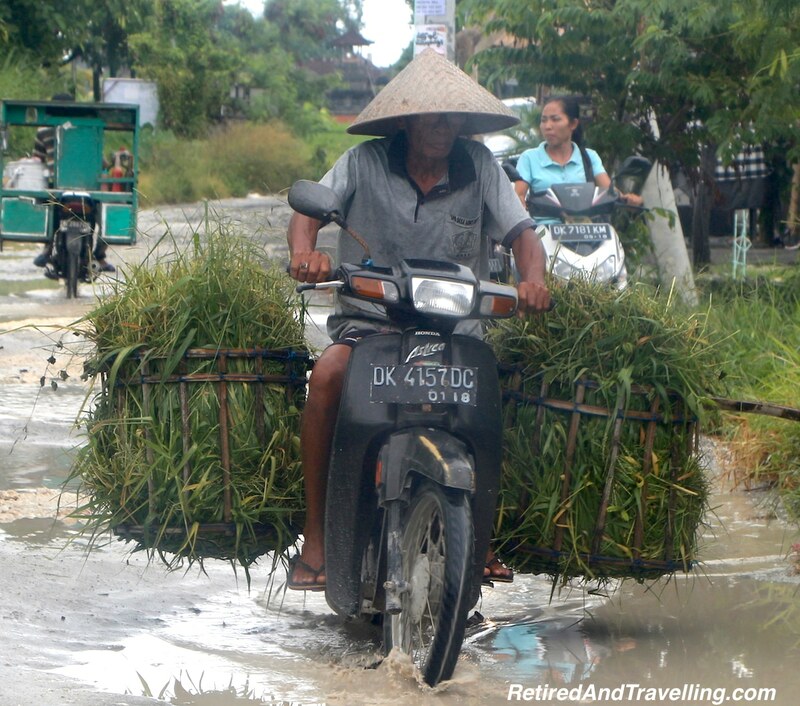 While we have rented scooters to travel around other islands that we have visited, we were never tempted during our visit to SE Asia. 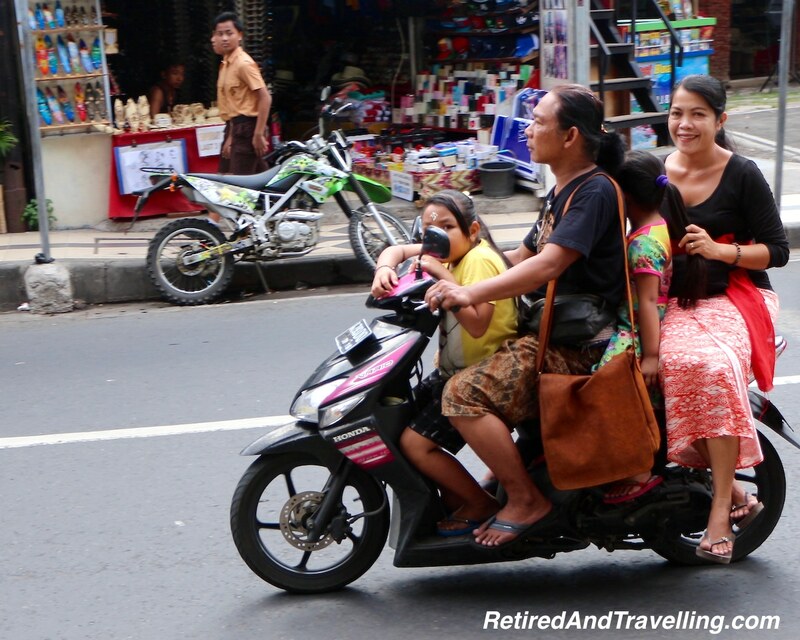 We were continually amazed how well the locals used scooters and bikes for carrying very large loads while navigating the busy roads. If you do rent a scooter, you needn’t worry about filling up your scooter at a regular gas station. 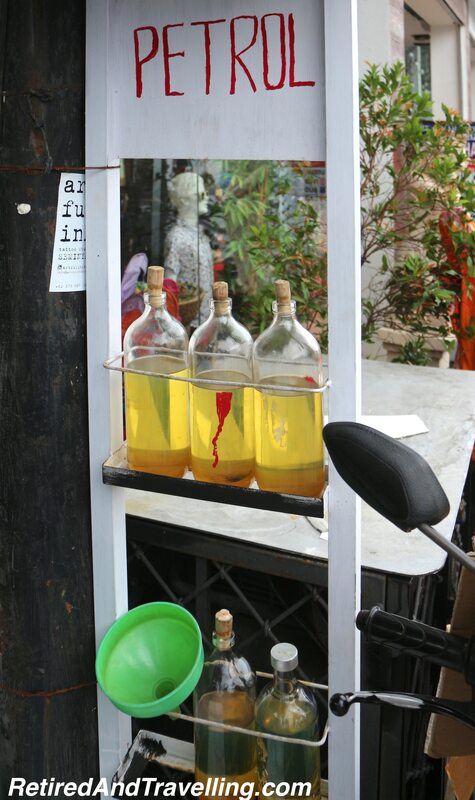 Every road has a ready supply of “petrol” for sale in small bottles and jars. When we travel we normally start with public transit as our default mode of transportation but we found that public transportation was not going to really be feasible for much of our exploring around the island. The distances we wanted to travel were not really reasonable without an impossibly complex and long set of bus transfers. We did not want to spend all of our week in Bali paradise in a mini bus! 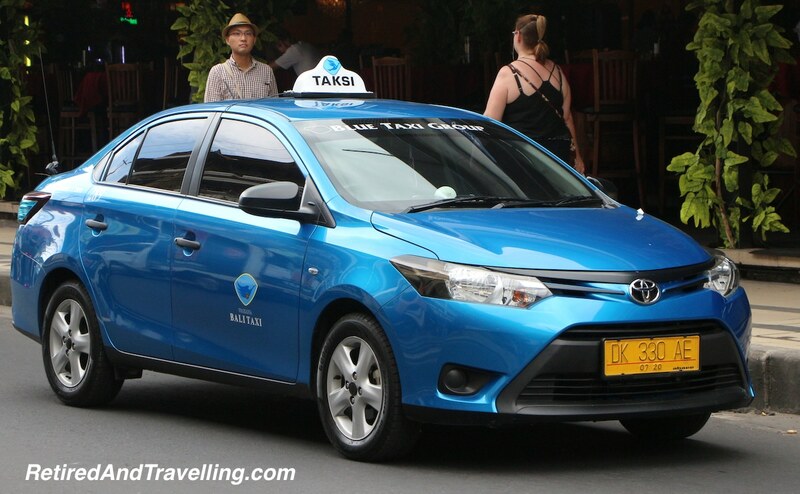 For shorter very specific transits during our week in Bali paradise, we generally stuck to using taxis. Having done our homework in advance, we knew to look for the Bluebird “taxsi” and to ensure that the meter was started. 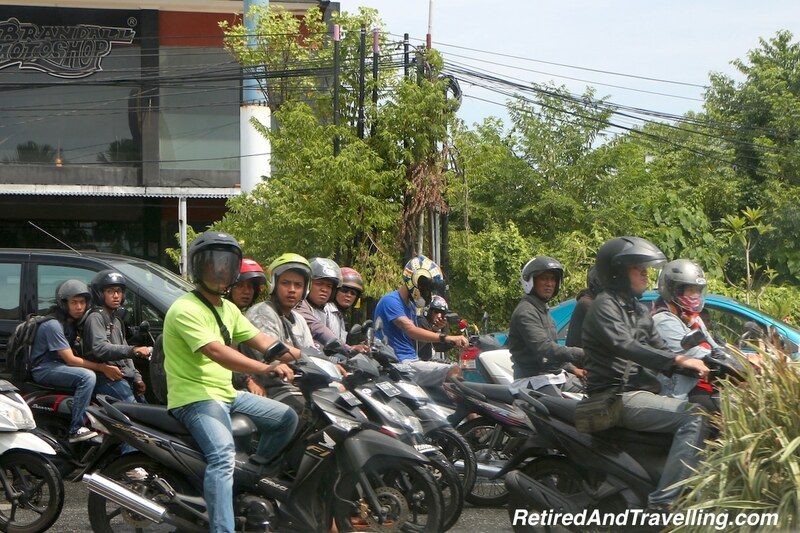 As we found in much of our travel throughout SE Asia, the meter price was generally much less than any fixed rate a taxi driver would give you. When we travelled with Nick, if he had access to wifi (as none of us had put a Bali SIM in our phones), he would call us an Uber. 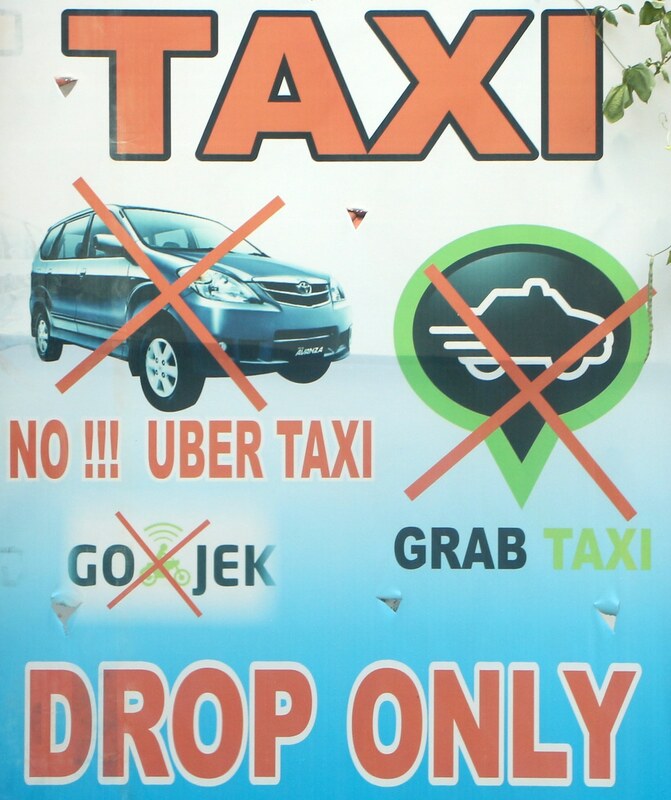 We had great success with using Uber in Bali and generally the fares were about half the taxi fares and the cars were so much nicer. We could see why Uber was taking business from the taxis. But there were parts of Bali that he found had banned Uber – so he always needed to ensure he didn’t get stranded! For days when we wanted to do specific tours on our week in Bali paradise, we could have considered a fixed tour with a tour company. The hotel had a large set of tours that they could recommend. The better option for us was to hire a driver for a day. We got a recommendation for a driver named Joni and we used Joni when we wanted to wander on our own away from the hotel for a full day. The full day rate is somewhere between 500,000IDR and 850,000IDR ($50 to $85CND) depending on how long you are out and where you go. You can negotiate in advance for the rate. Note that you may be asked to pay for police fees or tolls. We also fed our driver through the day. But we still found the flexibility of having a driver to be worth the price. 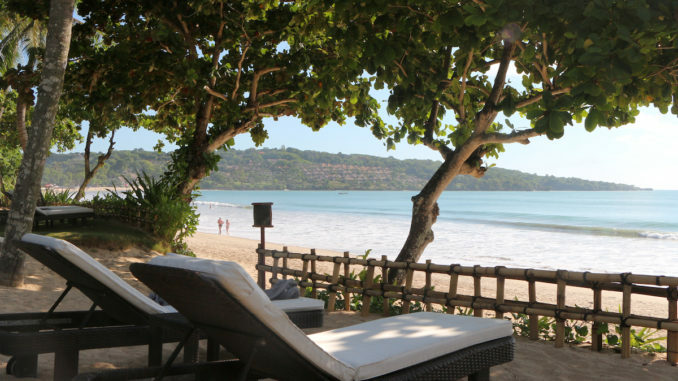 Our days staying local in Jimbaran Bay during our week in Bali paradise were spent by the great set of pools, at the beach or walking down the beach to the great selection of beach seafood restaurants. One day we took a taxi into Kuta to shop. We were dropped off in the midst of a shopping street to explore the multiple floors of the Matahari department store. David had already determined that in the heat and humidity he would need more thin cotton shirts and Nick was replacing some of the clothes he had already worn through in his month travelling. The men shopped while I watched! 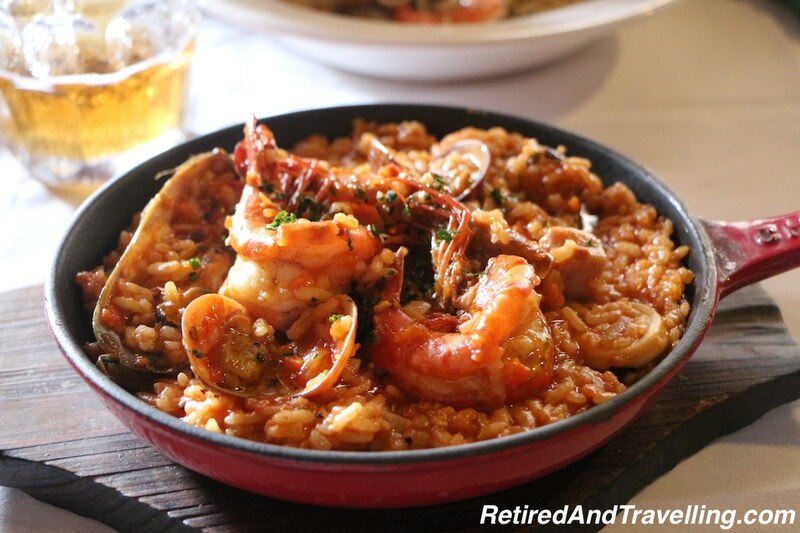 Once they were all shopped out we wandered and found an Italian restaurant (El Dente). I was surprised to find that Nick was right when he said that you could get great Italian food in Bali. 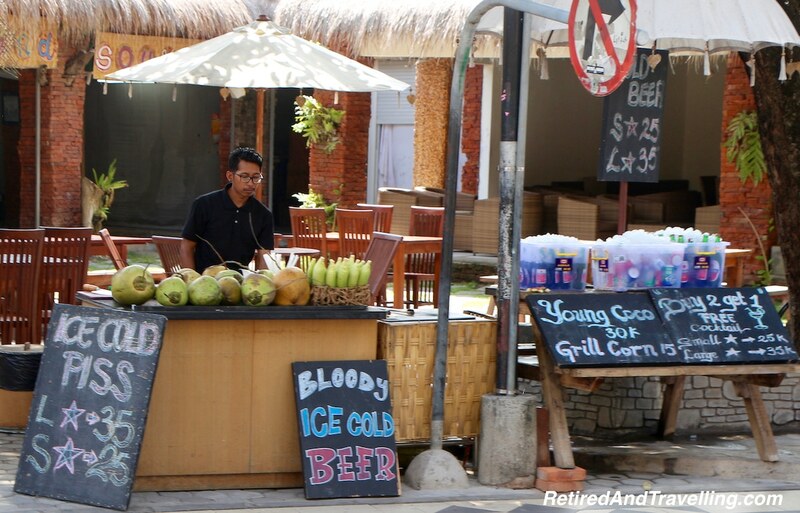 And like much of SE Asia, you could find food and drink in the street almost everywhere you went. 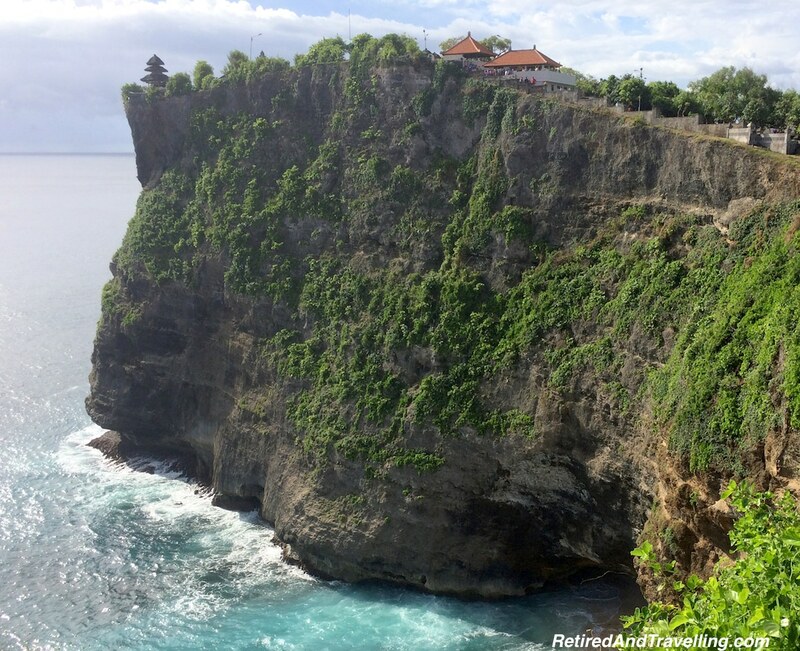 We did a half day trip to the south of the Uluwatu peninsula to see the Uluwatu Temple, the first of the many temples of Bali we would see on our travels during our week in Bali paradise. 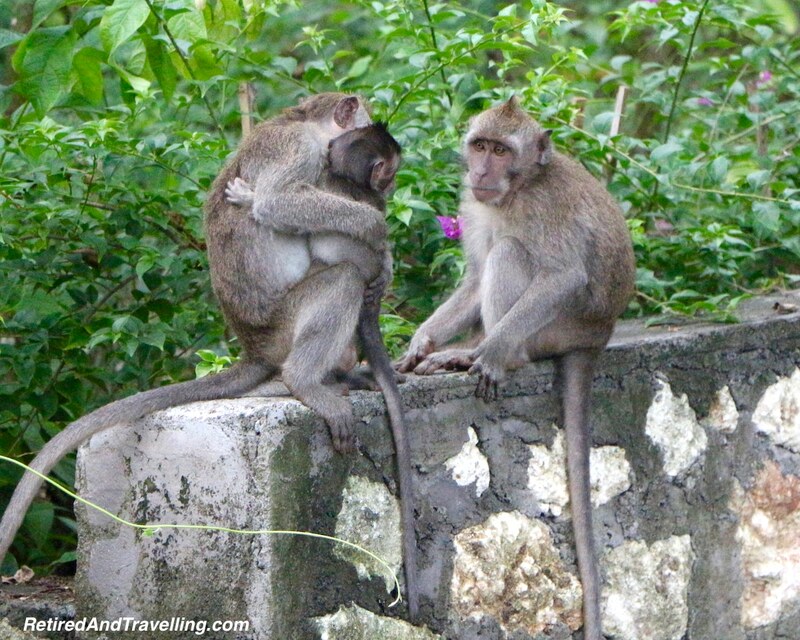 At Uluwatu we had our run in with the wild monkeys that you can find in many spots around Bali. Be sure to hold onto your sunglasses as they will jump you to grab their reward! Nick had been staying in Canggu and he was excited to share the local non-touristy spots in Canggu that he had found while staying in this less developed area. Canggu for a day trip was on our list for our week in Bali paradise. We spent a rainy day watching the surfers and then checking out the local Deus motorcycle bar. 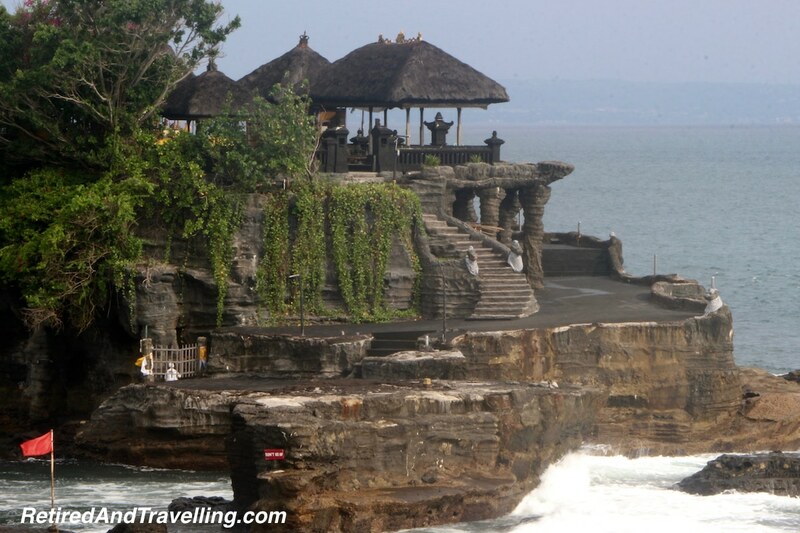 When the rain held off for a few hours, we had the famous Tanah Lot Temple site almost to ourselves. 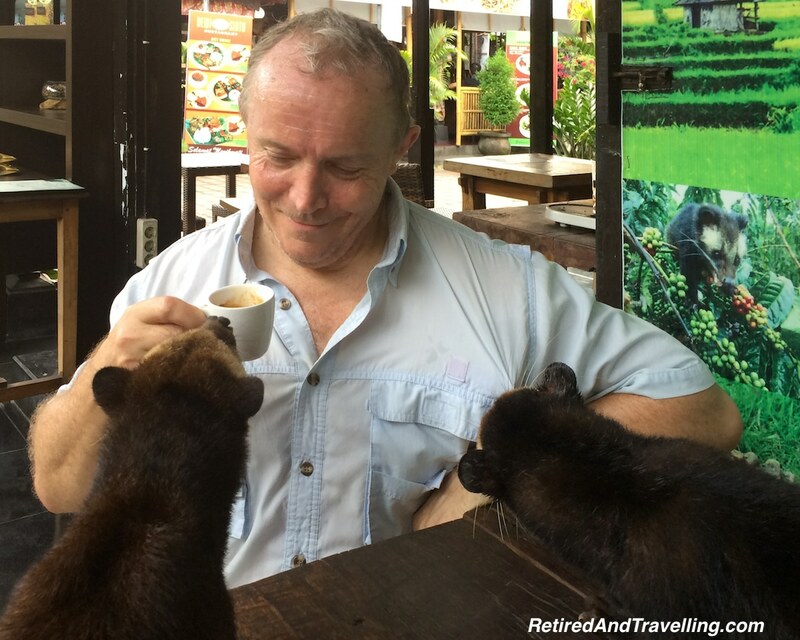 The highlight of the walk through the market to get to Tanah Lot was the visit with the luwaks before we tried the Kopi Luwak coffee. 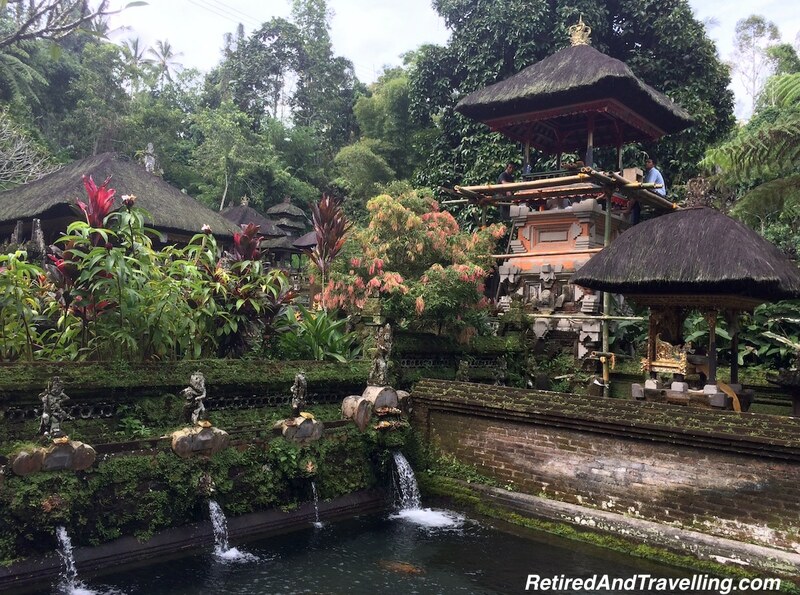 Ubud was next on our plans for our week in Bali paradise. 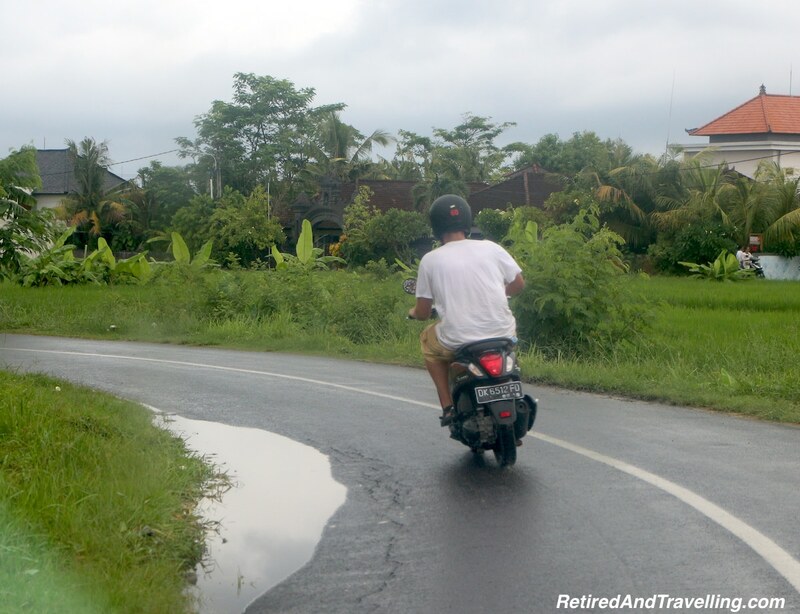 With a list from Nick of things he had done exploring for a week in Ubud, we headed for our long day. 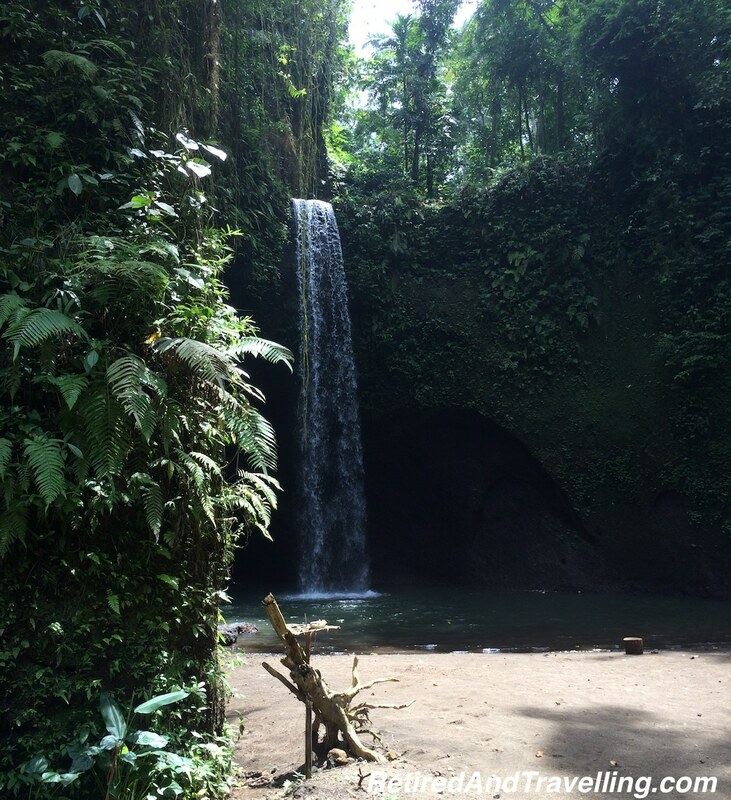 We enjoyed a tranquil time under the secret waterfall before we headed into the heart of the Ubud area. We enjoyed our few stops for lunch and at a coffee factory before we visited yet one more of the temples of Bali. 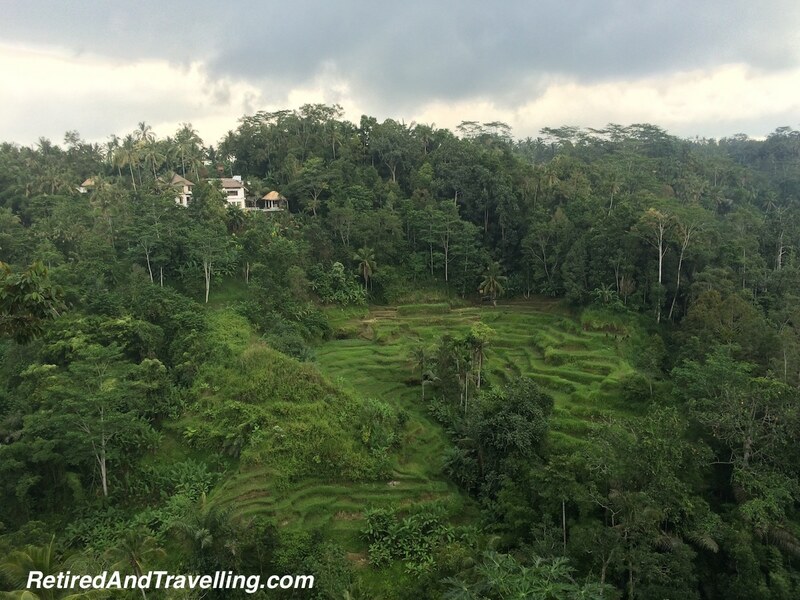 No stop to Ubud would be complete without the sight of the terraced rice fields. We had a full week in Bali paradise with a great mix of lazy resort time mixed with day trips to taste test some of what Bali had to offer. We did not see everything on Nick’s list but we saw enough to tempt us to come back again for a longer visit. We would have liked to get to the volcanos on the northeast side that we caught a brief glimpse of when we were flying out. Being sick also hampered our ability to do the snorkelling and scuba diving we had wanted to do in Bali. 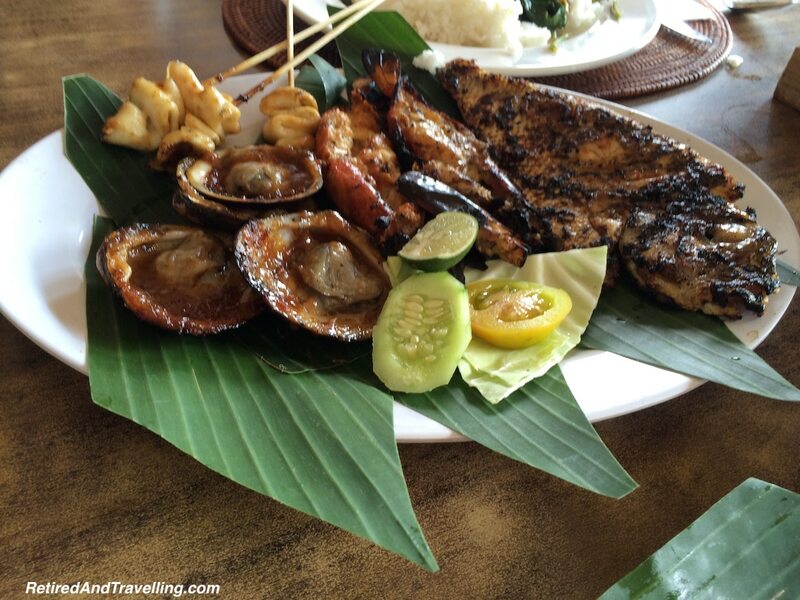 Nick had strongly recommended that we visit Nusa Lembongan and we had wanted to do the Gili Islands. But all of that would wait for a return visit. We were headed next to Singapore with Nick. It would be a quick 3 days before heading on to Thailand. 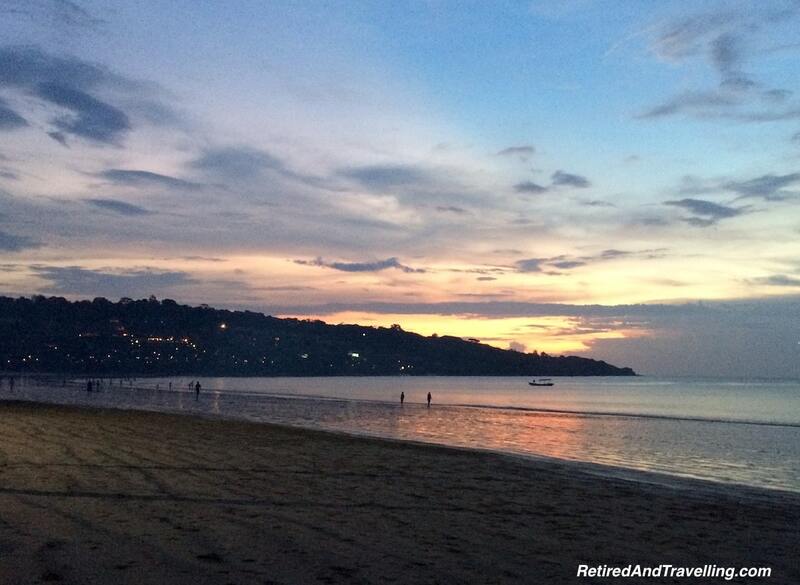 Did you enjoy a week in Bali paradise? What was your favourite thing to do? 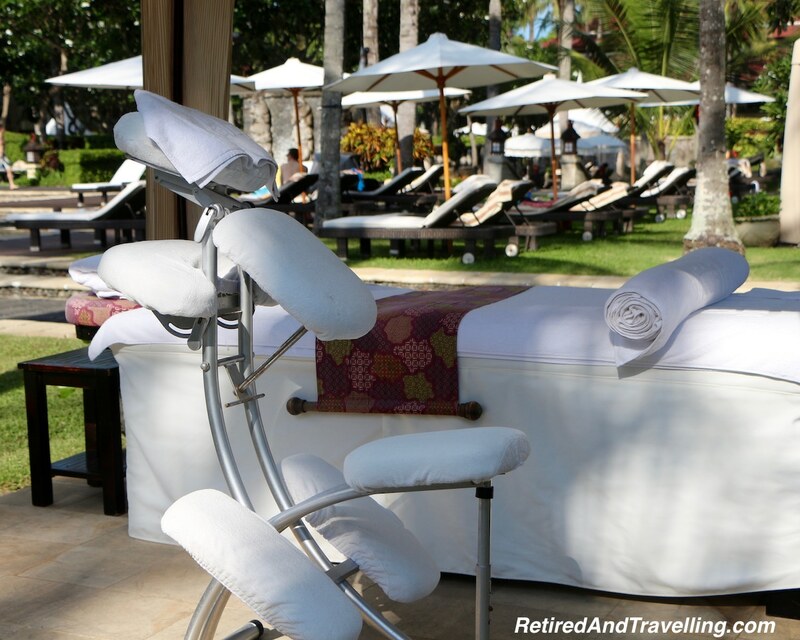 How long do you think is needed for a full Bali visit?